If anyone is still of the misguided opinion that women aren't funny, then GASP! Theatre Company is here to prove them wrong. 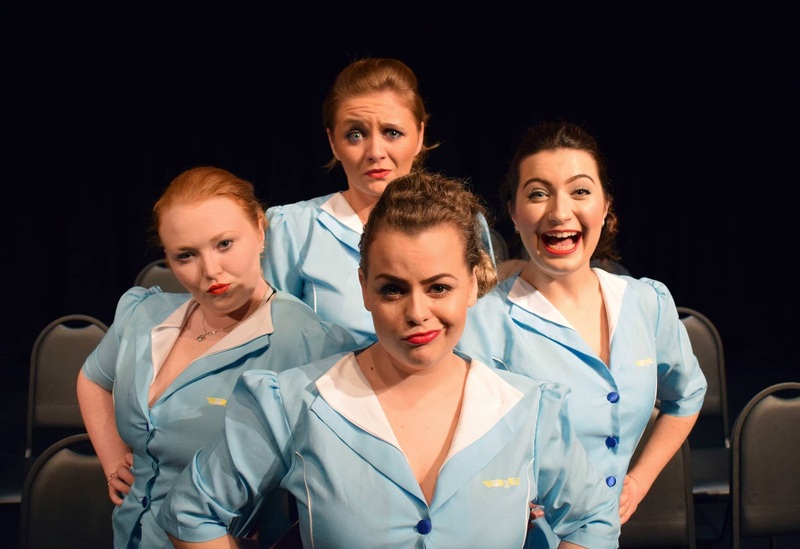 Having taken their brilliant debut production She Wears The Trousers to the Edinburgh Fringe in 2016, the all-female theatre company is now bringing their new comedy Not All Plane Sailing to Hoxton's The Courtyard Theatre. Alexandra Saunders-Yates's Norma leads a pack of air hostesses on board the fictional Concorde 9945 as they navigate their way through a flight filled with irritable passengers, rowdy kids, and a pair of laddish pilots. With a cavalier demeanour and a list of anecdotes that keeps on giving, Saunders-Yates makes an instant impression as she introduces new recruit Joyce to the ways of Pork Air, the madcap airline at the heart of the Not All Plane Sailing. The Company, which both write and perform in their productions, are sharp witted and hilarious, and perform every scene with twinkles in their eyes. There are a mixture of jokes; some outlandish, some understated, which shows off the versatility of their talents. There’s also a fair bit of toilet humour as well, for balance. Not All Plane Sailing also shows GASP!’s mastery of prop comedy, which is choreographed to perfection. Countless wigs, hats and jackets are donned as the actors multirole a multitude of different characters, from a serene Australian vegan to an oikish schoolboy, with the expressive Sophie Kronenberg giving a genius performance as the latter. Meanwhile Georgina Stafford and Philippa Holmes pop up intermittently as the plane’s brash and crude pilots, complete with aviator sunnies and giant fake ‘taches. Not All Plane Sailing may seem like all fun and games, but GASP!’s smart writing also allows for plenty of sly jabs at today’s socio-political issues, especially those pertaining to the treatment of women in the workplace. From the air hostesses’ over the top blusher and eyeshadow, to their regulation pink nail polish, they clearly parody the groomed perfection which many airlines demand (‘there’s Veet in the back’ snaps Alexandra Saunders-Yates’ head honcho air hostess Norma as she runs her hands down her colleague’s leg). And there's plenty of similarly savvy quips throughout too. Seamlessly combining satirical commentary and smart gags, the face-achingly funny Not All Plane Sailing is a laugh out loud romp which never slows down!